This young man below is really good at last minute requests. He is in Spanish 3 and they had some sort of Fiesta planned for today that he did not tell us about until 9:00pm last night. He said that we just had to whip up something called Flan and that his whole grade and the grades of his fellow project people's grades depended on "The Flan". You probably don't need to know my true reaction while I was sitting on the couch (already in my red robe) enjoying whatever was on. (Aggie Basketball.) Luckily I WAS already in my robe and was not the one chosen to go to the store for the ingredients that Wes said he was sure we already had! So, Sid made the trek to Kroger with Wes. I got up this morning at 5:30am to try to make Flan, which I have never attempted before. I got Wes up just to enjoy the time together! ;) Anyway, we got it done after 4 hours of cooking the gooey thing and hopefully a GOOD grade will be reported soon! Aren't kids fun?!!!! Someone has said if Christians really understood the full extent of the Power we have available through prayer, we might be speechless. Did you know that during World War II there was an adviser to Churchill who organized a group of people who dropped what they were doing everyday at a prescribed hour for one minute to collectively pray for the safety of England , its people and peace? Stop whatever you are doing and spend one minute praying for the safety of the United States , our troops, our citizens, and for a return to a Godly nation. This Makes Me Laugh...Thanks Mom. It has been an emotional, wonderful ,long weekend. I was blessed to be able to attend the funeral of a dear friend and wonderful man. Willard Tate will be so missed. Life for our family will just not be the same without him. His funeral was a lovely tribute to his life and his love for God and family. The rest of the weekend was filled with time spent with my sweet parents, a surprise birthday party for Mom and Dad, worship together, Thai food with Larry and Pam Henderson, a trip to the Ranch, Sing Song at ACU and an incredible Switchfoot concert. Yes, we packed it in and a good time was had by all. A few pictures below of some of the fun. See the turkeys? The time driving around at the ranch was wonderful. Have you ever seen a more lovely sky with puffy clouds? Wes, fishing on the dock at Mom and Dad's house. Case and Ben at the birthday celebration. Pam and Larry's dining room. Beautiful. Sticky Rice that Pam was making for us. Yum. This is an incredible video of the Window Trail in Big Bend National Park in the Chisos Basin. We have hiked this trail many times and it is a beautiful, and a little bit of a tough walk down and climb back. The Window at the end is something to see and a bit nerve racking. You could slide right off the end of the trail. If you are interested watch just until 7:54 or so. That is where his video of the trail ends. He gets so close to the edge it is just about nauseating. ha. The video gives me camping and Big Bend fever. Doesn't it look warm and wonderful? Listen to the birds singing! Ah... Visiting Big Bend is lovely and warm and peaceful and mind clearing and well... awesome. Latest wonderful find on Craig's List. This lovely, practically new RED couch. Have I mentioned I LOVE RED? I have a red checked couch that Mom gave me long ago sitting across from this couch in my living area. Anyway, Craig's List is a great way to find quality furniture in your area for great prices. The furniture is usually better than garage or estate sale finds. Just wanted to share my excitement in finding a bargain and a RED couch! And...Craig's List is FREE! We have sold several pieces of furniture on this site. Free and easy. http://www.craigslist.org/about/sites The new RED couch with the red checked couch. They make me smile. Just wanted to share a picture of two RED birds that were eating and playing in the snow a few days ago. So beautiful. We drove around on Friday morning taking pictures of snowmen. I have to say it was one of the more delightful days I have enjoyed in a long time. These are just a sampling of snowmen. I could have taken probably a hundred more pictures. They were everywhere. This snow event for our town was very unusual. I heard someone say this only happens every 25 years or so. The snow was heavy and wet and wonderful for making snowmen. Enjoy and blessings on your day. I will leave you with the snowmen and smiles and this scripture that encouraged me this morning. Ps. 72: 18 &19 Praise be to the Lord God, the God of Israel- who alone does marvelous deeds. Praise be to His glorious name forever! This one had already lost his banana mouth. Not sure what this is but it made me laugh. Will's in the tree snowman ghost. So cute. Fisherman snowman...not sure about the duck. Good morning. Our world lost a beautiful person last night. 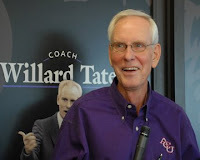 Willard Tate, former coach, teacher, motivational speaker, preacher, husband and father. Wow, so many more words should be used to describe this man. I am crying as I write this because I cannot express how much I loved him and how much my parents and brothers loved this man. He was a light for God and a great friend. In a world of pain and the ordinary, he was full of color and life and enthusiasm and beauty. He had a way of expressing great "heart truths" to people when he spoke. When he preached and talked about God his words always brought us closer to the throne and the arms of God. Willard and his wife Bobbie have been special friends to my Mom and Dad. There have been some really tough things that these couples have walked through together and Willard has been an incredible support and friend to my Father for years. Thank you God for the beautiful friendship and bond that they have enjoyed. So, what is it about snow that turns me into a 10 year old again? I think I was just as or more excited than my boys and Sid about everyone having a snow day. As we went out to take pictures early this morning I saw that I was not the only one that had a joyful look on my face. From little child to middle aged men to older women...they were out walking and smiling and building snowmen, having snowball fights. I did not see one person that was not wearing a smile. Thank you Father for this awesome beauty and the joy it has brought us all this morning.